CrossFit Webster is a community of support, education, and encouragement to help you reach your fitness goals. 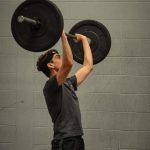 CrossFit Webster IS DEDICATED TO MAKING YOU STRONGER, AND HEALTHIER. No matter your goals, we will help you come up with a roadmap and a timeline to achieve them.